What information does RES-Q collect? The primary goal of RES-Q is to improve the quality of stroke care in central and eastern Europe by providing data that can be translated into healthcare policies and guidelines on both a national and European level. As a European Stroke Organisation (ESO) driven initiative, RES-Q is a pan-European, collaborative effort on the part stroke treatment centres, clinicians, and researchers to rapidly improve the level of stroke care throughout all participating countries. The performance measures that allow for standardized comparison of stroke care quality were published in Stroke 2015 (Bo Norrving et al). 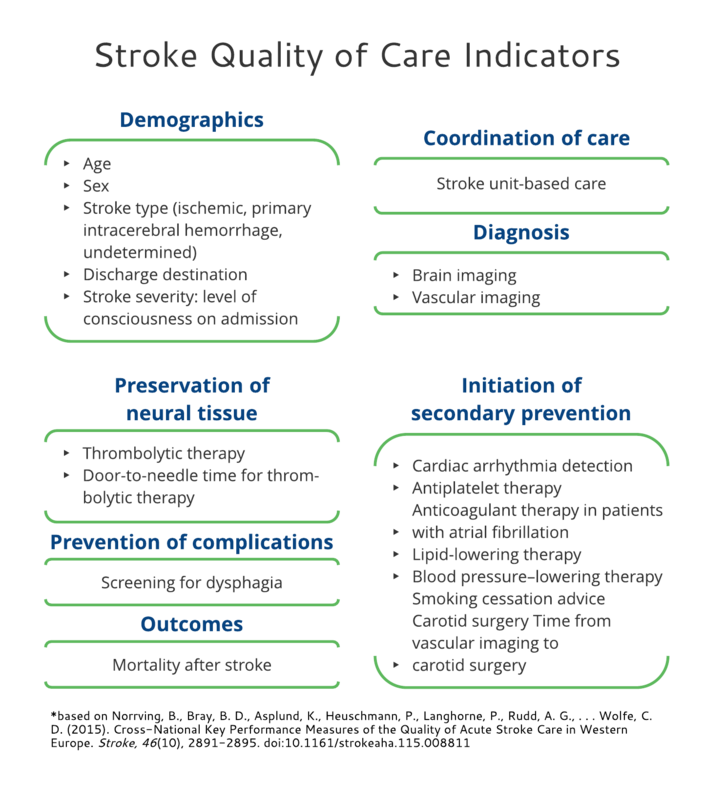 These performance measures include areas covering: coordination of care (stroke unit–based care), diagnosis (brain imaging, vascular imaging, cardiac arrhythmia detection, and therapy assessment), preservation of neural tissue (thrombolytic therapy and door-to-needle time), prevention of complications (dysphagia screening), initiation of secondary prevention (antiplatelet, anticoagulation, lipid lowering, blood pressure lowering, carotid surgery, time from vascular imaging to carotid surgery, and smoking cessation), survival (90-day post-stroke mortality), and functional outcomes (90-day modified Rankin Scale). This project aims to provide physicians, managers, professional societies, insurance companies, Health Ministries, the European Commission, and other policy makers with a tool that will inform them about the unmet needs in the management of stroke care and the implementation of evidence based practices. It will identify country specific targets and set the baseline for future decisions, plans, and actions to improve stroke care quality. In this project, the goal is to develop a new registry (and integrate data from existing ones in select countries) to monitor the most important quality (performance) measures for stroke care. 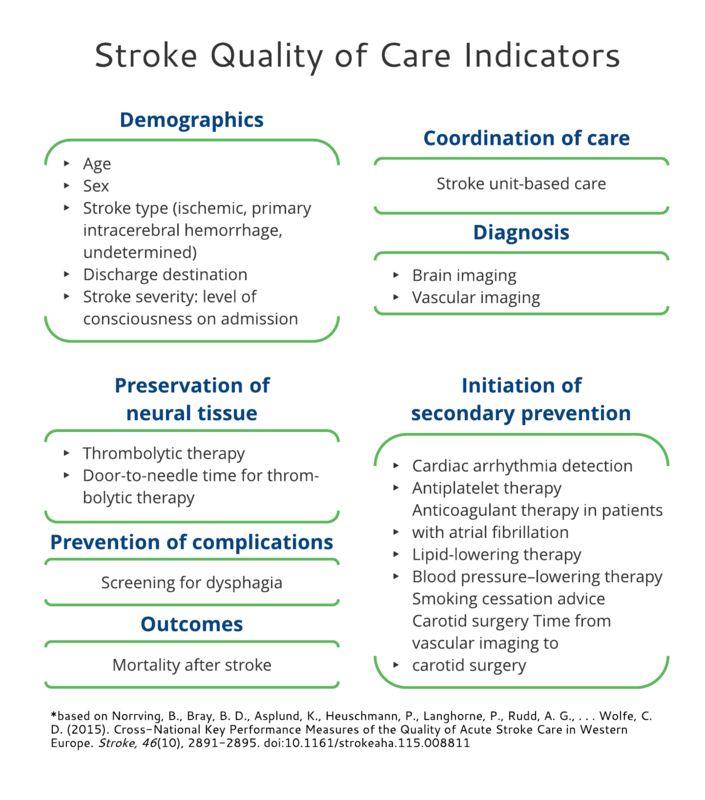 The collected data should provide a snapshot of the level of quality of care and prioritize the targets for interventions to improve stroke care quality. Usually, providing feedback on stroke care performance establishes motivation for many hospitals and physicians to improve stroke care quality. It is anticipated that data will come from different databases, from many hospitals and countries, and that it will provide important information to support and guide public health policies for one of the most devastating diseases - stroke. The final goal is to improve stroke care quality and decrease disparities in stroke care between different countries. Click on the image to make it bigger. Click anywhere inside it to close. Click anywhere inside the screen to close. Approximately 17 million strokes occur annually in the world and stroke is the second leading cause of death globally after coronary heart disease. The true burden of stroke, however, also includes chronic disability. Stroke patients often require extended hospital stays followed by rehabilitation, on-going support from the community, and nursing-home care. Thus, stroke is not only a serious health issue for society, but a significant economic burden as well. Stroke is a major cause of neurological disability, not only in the elderly, but also in younger age groups: in 2010, 31% of the reported strokes were in children and adults <65 years. It is estimated that the burden of stroke is higher in Eastern Europe (and developing countries) as compared to western European countries. The major reasons for this are: a different risk factor profile (higher prevalence of risk factors in the east) and disparities in stroke care (low quality of stroke care in the east). These disparities must be addressed. Stroke can be effectively treated: there have been huge advances in acute stroke treatment. Intravenous thrombolysis has been implemented into clinical practice in many countries during the first decade of the 21-century. Recently, in several clinical trials published in 2015, mechanical thrombectomy showed a huge clinical benefit in reversing neurological deficit, even in very sick patients. Moreover, other procedures, such as admission to the stroke unit, early prevention, decompressive hemicraniectomy, dysphagia screening and other measures, significantly improve outcome after stroke. Despite a large number of studies in stroke management, the implementation into clinical practice is slow, e.g. thrombolytic rate is around 5% of the ischemic strokes, while in many Eastern European countries it is negligible. It is worse in the case of mechanical thrombectomy, which is costly. However even low cost procedures, such as dysphagia screening, are not well implemented into clinical practice. In conclusion, stroke is a treatable and preventable disease as effective treatments do exist, unfortunately, the implementation has been suboptimal. 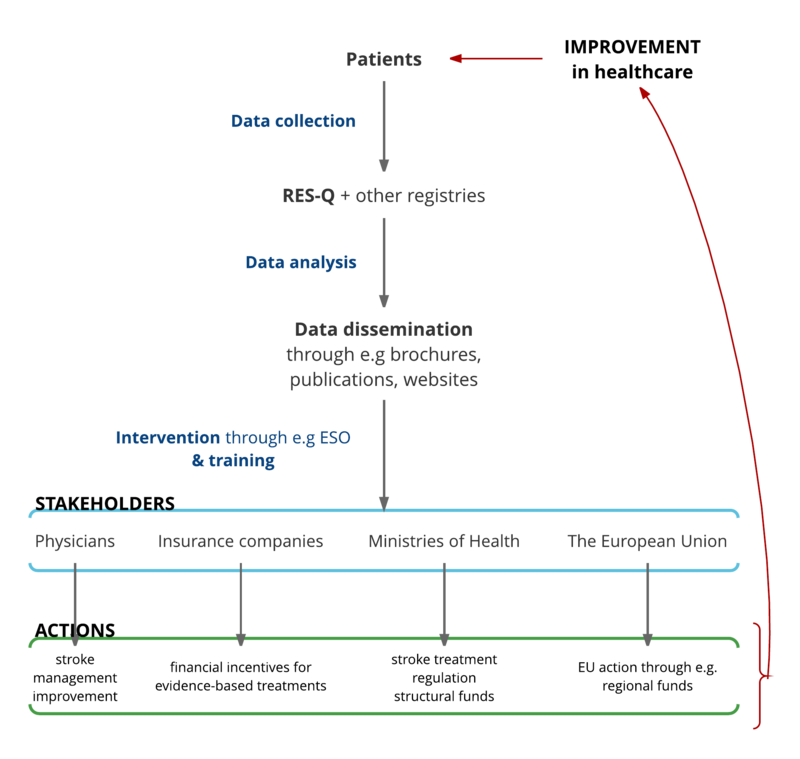 RES-Q endeavors to bring together stroke care quality data from clinical sites across Europe. RES-Q will provide multiple contribution methods, from paper documents to fully web deployed e-forms, to allow for data collection from a broad range of facilities. The goal is to use these heterogeneous data sources to generate a clear picture of the gaps and areas of improvement in stroke care quality in a variety of geographically, economically, and demographically diverse areas regardless of the technological capacity of the local stroke center. 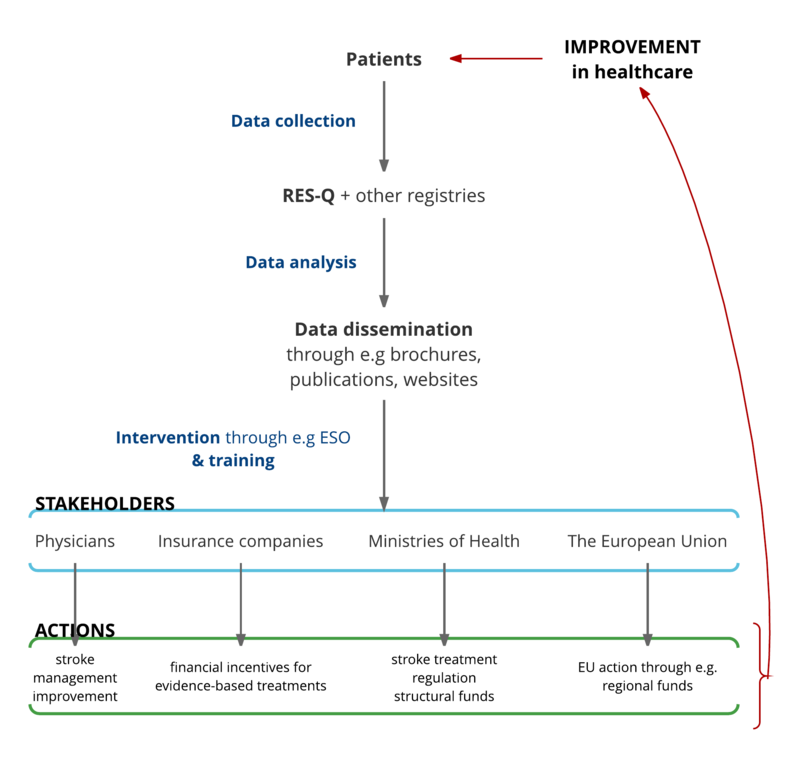 To promote sharing and reusability of data, the RES-Q project will also integrate existing quality registries from multiple participating centers. This will allow centers to collect their own local data while also contributing to building a larger picture of stroke care through contribution to RES-Q. This will also allow for retrospective analysis from participating centers that will contribute stroke care data from prior to the initiation of RES-Q. This collaborative, global effort will result in the establishment of an extensive network of contributing sites that will serve to inform current public health strategy and to guide the development of stroke care strategy in the future. The purpose of RES-Q is to develop a cohesive picture of the current effectiveness and consistency of stroke treatment amongst member states. ESO is already active in developing and advocating for public health policy changes to improve stroke care. RES-Q will provide a platform to both collect and share data specifically about how these policies are affecting actual clinical practice. Bringing data from all participating sites, including sites with existing registries, will drastically improve ESO’s ability to make accurate and timely recommendations to public health officials for new guidelines that should be implemented to improve overall patient health. The variables we are currently collecting can be seen in the image below. Click on the image to make it bigger. Click anywhere inside it to close. For a more detailed listing in pdf form, please click here.